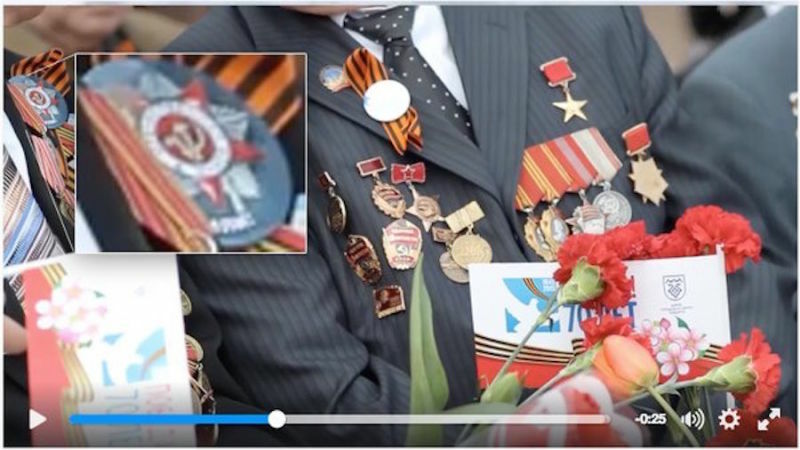 Donald Trump put a new veteran-focused campaign ad up on Facebook today, but it was pulled down before most anyone could see it after commenters pointed out that the footage clearly depicted Russian veterans wearing the distinctive St. George ribbon and pins with the Communist hammer and sickle. Above you see the original ad. “Our great veterans are being treated terribly,” Trump intones his most serious voice. “The corruption in the Veteran’s administration, the incompetence is beyond. We will stop that.” The ad then cuts away from Trump sitting at his desk and to footage of faceless decorated veterans who happen to be wearing a distinctive orange-and-black ribbon. You see it there pinned to the nice man’s lapel. 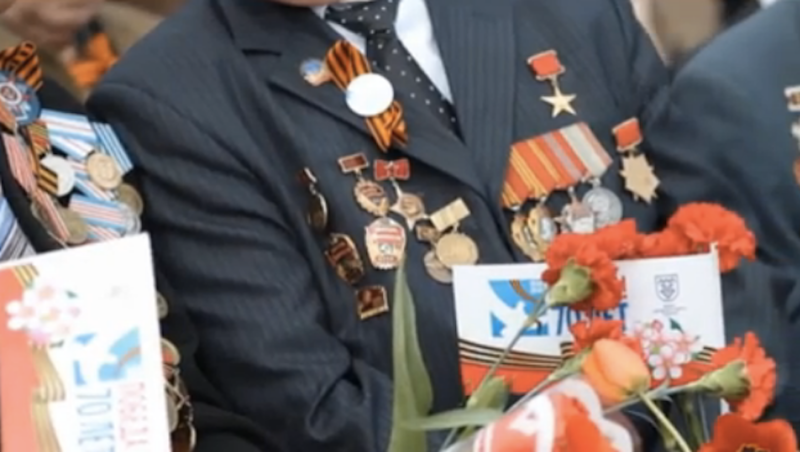 This Washington Post article from 2014 explains the history of the ribbon, which is traditionally “associated with Russian military valor” but recently has come to be adopted by right wing Russian separatists. You can also see the man to the left of the frame proudly displaying the hammer and sickle. 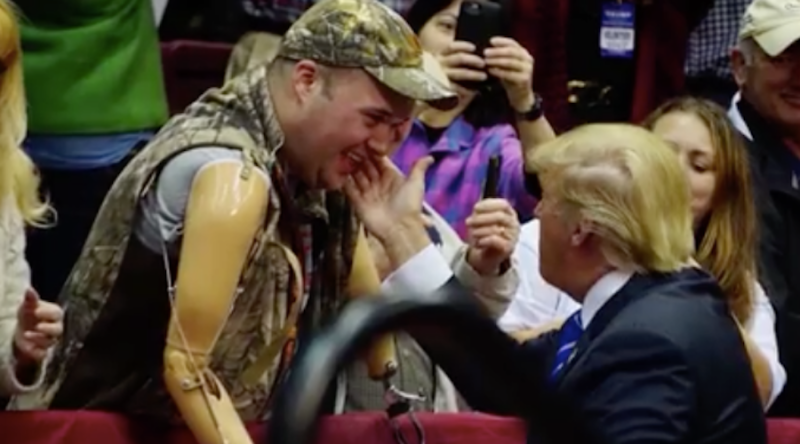 The ad as it currently appears now cuts to a still of Trump cradling the face of a presumably American veteran with a prosthetic arm. This isn’t the first time that Trump’s campaign has bonked a campaign ad, and it isn’t even the first time Trump’s campaign they’ve done so by using footage of foreign soldiers in a video meant to inflate Trump’s patriotism. Back in July 2015, when the Trump candidacy still seemed like a prank, he tweeted an image that used a stock photo of fake Nazi soldiers. Trump’s first TV ad, cut earlier this month, purported to show Mexicans streaming across our southern border. In actuality, the footage, pulled from an Italian TV station, was of migrants crossing into Morocco. 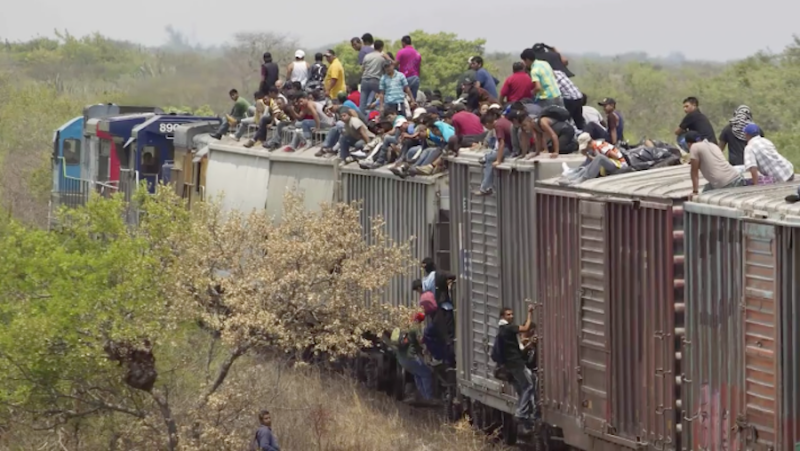 Further, a tipster pointed out to us today that a Trump immigration ad from four days ago posted to Facebook shows a still image of migrants atop a train. Though the implication, once again, is that we’re looking at our border, the image actually comes from a Daily Mail article about citizens of Central American countries fleeing into Mexico. 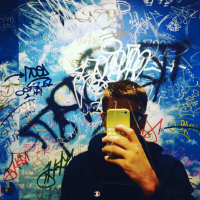 Contact the author at jordan@gawker.com.